During the reign of Akhenaten The Aten was installed as the principle god of ancient Egypt, and the worship of many of the traditional gods of ancient Egypt was rejected. The Aten was not a new god but an obscure aspect of the sun god worshipped as early as the Old Kingdom. 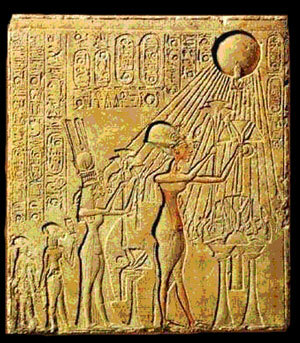 “Aten” was the traditional name for the sun-disk itself and so the name of the god is often translated as “the Aten”. For example, in the coffin texts of the Middle Kingdom the word “Aten” represents the sun disc, and in the ‘Story of Sinuhe’ (also from the Middle Kingdom) Amenemhat I is described as soaring into the sky and uniting with Aten, his creator. During the New Kingdom, the Aten was considered to be an aspect of the composite deity Ra-Amun-Horus. Ra represented the daytime sun, Amun represented the sun in the underworld and Horus represented the sunrise. 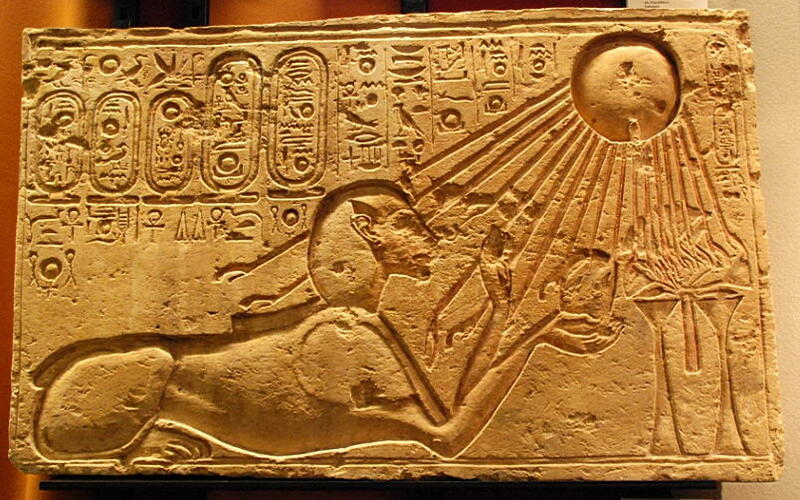 Akhenaten proclaimed “the Aten” (the visible sun itself) to be the sole deity, taking sun worship a stage further. Because of the naturalistic qualities of some of the art works of the time, some have suggested that his religion was based on the scientific observation that the sun’s energy is the ultimate source of all life. In its early stages Atenism is best described as a henotheistic religion (a religion devoted to a single god while accepting the existence of other gods) but it developed into a proto-monotheistic system. The full extent of his religious reforms were not apparent until the ninth year of his reign. As well as proclaiming the Aten the only god, he banned the use of idols with the exception of a rayed solar disc. He also made it clear that the image of the Aten only represented the god, but that the god transcended creation and so could not be fully understood or represented. 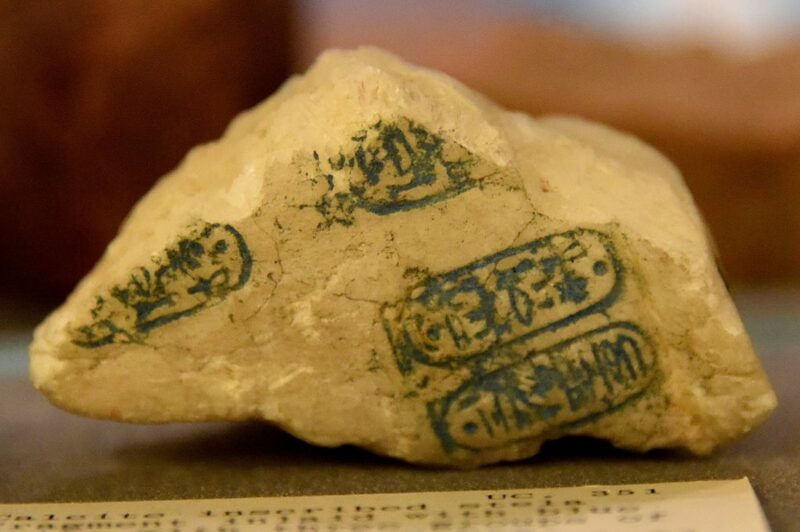 This aspect of his faith bears a notable resemblance to the religion of Moses, prompting Freud to suggest that Akhenaten was the first Monotheist. A number of hymns to the Aten were composed during Akhenaten’s reign, some apparently by the king himself. They describe the wonders of nature and hail the sun as the absolute and universal lord of all things. In particular, the Hymn to the Aten (recorded in the tomb of Ay, the vizier Akhenaten who became pharaoh after Tutankhamun) has become famous as many commentators have argued that it closely echoes Psalm 104 which describes the wonders of nature and ascribes ultimate power to Yahweh, the Hebrew God. There is indeed a certain similarity in the type of language and the content matter, but those who argue the two texts are the same are perhaps exaggerating slightly. The Aten was worshipped in the open sunlight, rather than in dark temple enclosures, as the old gods had been. However, far from being open to the people, only Akhenaten (and his family) could connect with the god. In the Hymn to the Aten, Akhenaten states “there is none who knows thee save thy son Akhenaten”. Perhaps unsurprisingly, excavations at Akhetaten (Armarna) have indicated that the ordinary people did not take to the new religion but continued to worship the old gods in private.